It happens every year starting the middle of August and runs through the week after Labor Day. Back. To. School. Photos. Most of the people on my social streams have human kids. One photo after another after another. While I enjoy seeing the human kids dressed in first-day-of-school attire, and all the creative photo props, it gets redundant. I feel the same way about graduation photos. Since when did kindergartners start wearing caps and gowns? 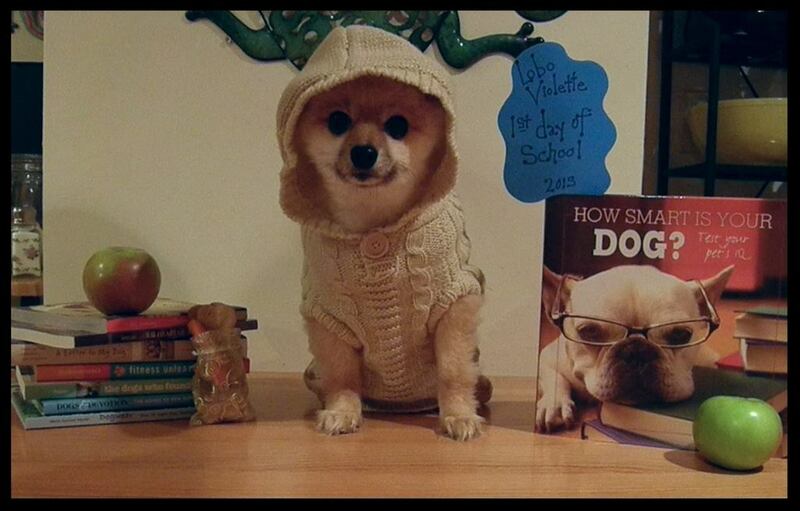 As dog Moms, we feel left out of the back-to-school festivities. Our kids obviously don't attend school. Or graduate. But, we're Moms. Unconventional. Always trying to see the humor is stuff like this. The other day I mentioned to Lisa that we should put together some back-to-school garb for the kiddos. I would create a few props and take photos. She laughed and wished me luck. Coco has an aversion to apparel. Sophie barely tolerates it. Lobo doesn't mind. On the overnight I put together a few props. Books. Apples. A little lunch sack. I retrieved a new Autumn sweater from his stack of apparel. When Lisa groggily made her way through the kitchen at 4 a.m., I was attempting to take Lobo's back to school photo. The first few came out...meh. Lisa grabbed a biscuit and held it up. Bribery at its best. As expected, Coco and Sophie wanted nothing to do with this ridiculousness. By the time Lisa left for work, I had enough photos. After a bit of editing, I posted on Facebook. There. Take that human kid Moms.